Development at Aérospatiale began in the early 1970s to replace the Aérospatiale Alouette II, and the first flight took place on 27 June 1974. A twin-engined version, known as the Écureuil 2, Twin Squirrel, or in North America as the TwinStar, first flew on 28 September 1979. Royal Malaysian Police Air Wing's Twin Squirrel. Prototype of the twin-engined Écureuil 2 or Twin Squirrel. Initial production version, with single hydraulics, powered by two Allison 250-C20F turboshaft engines. Improved version, with dual hydraulics and increased maximum weight of 2,300 kg (5,070 lb). Powered by two Allison 250-C20F engines, 2,400 kg (5,291 lb) Maximum weight. Powered by two Allison 250-C20F engines, 2,540 kg (5,600 lb) Maximum weight and a yaw compensation system. Initial armed version of AS355 F1. Armed version of AS355 F2. Superseded by AS555 Fennec. Version fitted with two Turbomeca Arrius 1A engines and a Full Authority Digital Engine Control (FADEC) system for better M.T.O.W (2,600 kg or 5,732 lb) and better single engine performance, tail rotor strake added along starboard side of tail boom for better yaw authority. Introduced in 2007, this version is fitted with two Turbomeca Arrius 1A1 turboshaft engines and a new AS350 B3-based main gearbox, increasing maximum take-off weight to 2,800 kg (6,173 lb). Assembled in Brazil by Helibras (part of Eurocopter). Assembled in Brazil by Helibras. Powered by the Allison C20F engine. FAA, TC, and EASA approved. Powered by the Allison C20F engine. FAA,TC and EASA approved. Powered by the Allison C20R engine. FAA and TC approved. AS355 F1 powered by the Allison C20R engine. FAA, TC and EASA approved. AS355 F2 Powered by the Allison C20R engine with optimised tail rotor blades. FAA, TC and EASA approved. 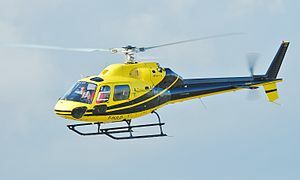 The AS355 Écureuil 2 is used by both private individuals and companies, helicopter charter and training organizations as well as law enforcement and government use. On 22 October 1996, an AS355 F1 Squirrel, registration G-CFLT, crashed in bad weather near Middlewich, Cheshire, England, killing all five on board. The people on board included Matthew Harding, a businessman and vice chairman of English football club Chelsea F.C. (the flight was returning to London from a Chelsea match in Bolton). The UK's Air Accidents Investigation Branch found that the pilot had insufficient qualifications and experience to fly in such poor conditions. In July 1998, the Kent Air Ambulance, a AS355 F1 Squirrel, crashed in good weather after colliding with power cables near Burham whilst returning to Rochester Airport following an aborted call to attend a road accident. All three crew – the pilot, Graham Budden, and two paramedics, Tony Richardson and Mark Darby – were killed on impact. In May 2007, Chelsea Football Club Vice President Philip Carter, founder of training company Carter and Carter, crashed in his part-owned Twin Squirrel registration G-BYPA returning from Liverpool John Lennon Airport after watching Chelsea play Liverpool F.C..
On 18 August 2011, a AS-355F-2 (reg No/ VH-NTV) crashed near Lake Eyre in South Australia resulting in three fatalities. The helicopter was owned by the Australian Broadcasting Corporation. On board were, Gary Ticehurst (ABC chief helicopter pilot for 25 years), John Bean (cameraman) and Paul Lockyer (journalist). All three had 20 years or more experience working for the ABC. On 20 October 2011, a Belarus border patrol Eurocopter twin-engine helicopter crashed close to the village of Vileity near the Lithuanian border and burst into flames, killing all five people on board, including three members of a television crew. On 29 March 2017, a Eurocopter AS-355F-1 Ecureuil 2 was lost over the Snowdonia National Park in Wales whilst en route from Luton to Dublin, carrying five people on board. ^ Perry, Dominic. "Airbus Helicopters ditches AS355 light twin." Flight International, 4 September 2015. ^ a b c d e f g "World Air Forces 2016". Flightglobal Insight. 2016. Retrieved 28 May 2016. ^ "Argentine Coast Guard Receives its First Ecureuil". Air International. Vol. 80 no. 3. March 2011. p. 28. ISSN 0306-5634. ^ "Austrian Federal Ministry of Internal Affairs". bmi.gv.at. Retrieved 5 September 2018. ^ "Государственный пограничный комитет вооружается европейскими вертолетами". .tut.by. Retrieved 1 March 2013. ^ "Парк воздушных судов". mchs.gov.by. ^ "Ontario Provincial Police upgrade from AS355F2 to EC135P2+". helihub.com. Retrieved 1 March 2013. ^ "Ontario Provincial Police AS-355F". Demand media. Retrieved 1 March 2013. ^ "JDF AS-355". jdfmil.org. Retrieved 1 March 2013. ^ "Royal Malaysian Police wants more helicopters". helihub.com. Retrieved 1 March 2013. ^ "NZ Civil Aircraft". nzcivair .com. Retrieved 1 March 2013. ^ "Russian Military Plans to Buy Foreign Helicopters". rian.ru. Retrieved 1 March 2013. ^ "AS355 NP Overview". eurocopterusa.com. Retrieved 1 March 2013. ^ "World's Air Forces 1987 pg. 28". flightglobal.com. Retrieved 1 March 2013. ^ "About the Air Support Unit". garda.ie. Retrieved 1 March 2013. ^ "Pilot disorientated on impact". BBC News. Retrieved 17 September 2007. ^ "Bulletin No:2/2000 Aerospatiale AS355 F1 Ecureuil II G-MASK" (PDF). Air Accident Investigation Board. Archived from the original (PDF) on 17 March 2009. ^ "UK Helicopter crash kills three". BBC News. 27 July 1998. Retrieved 4 January 2010. ^ "Millionaire Chelsea fan and his son die in helicopter crash". Daily Mail. 2 May 2007. Retrieved 15 August 2010. ^ "Collision with terrain – Aérospatiale Industries helicopter, VH-NTV, near Lake Eyre, SA, 18 August 2011". Australian Transport Safety Bureau. 19 August 2011. Retrieved 20 August 2011. ^ "ABC chopper crash probe could take a year". ABC News. Australian Broadcasting Corporation. 19 August 2011. Retrieved 20 August 2011. ^ "Missing helicopter: Police launch Snowdonia ground search". BBC News. Taylor, John W.R. Jane's All the World's Aircraft 1988–89. Coulsdon, UK:Jane's Defence Data, 1988. ISBN 0-7106-0867-5. Directory: World Air Forces. Flight International, 11–17 November 2008. pp. 52–76. Wikimedia Commons has media related to Airbus Helicopters AS355 Ecureuil 2. This page was last edited on 24 January 2019, at 03:28 (UTC).